(NewsUSA) - The world's largest celebration of opportunity in education starts next week. National School Choice Week 2018 begins on January 21, shining a positive spotlight on traditional public schools, public charter schools, public magnet schools, private schools, online academies, and homeschooling. The goal is simple: to let parents know that they have choices when it comes to their children's education, and to celebrate the many different and effective education options available for students. For almost every parent in America, there are ways to get involved in this positive, inspirational week. If you are looking to find a new school for your child and want to know how to start the process, use the Week as a time to research your options. Download a free school choice guide for your state at schoolchoiceweek.com/mystate. If you want to learn more about the different schools and education environments in your area, consider using the week to attend a special event. 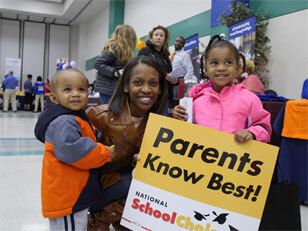 More than 32,000 are being planned during National School Choice Week - everything from information sessions, school fairs, and open houses, to rallies. Find an event in your community by visiting schoolchoiceweek.com/map. If you are happy with the choices you have made for your child's education, take time during National School Choice Week to thank a teacher or school leader, or to brag about your child's school in a letter to the editor of your local newspaper. You can also share your story with us at schoolchoiceweek.com/share. If you think that your community or state needs more educational choices for children, use National School Choice Week to speak up and make your opinion known. Making a difference is easier than it sounds. All it takes is starting one conversation. You can start that conversation on social media (using #schoolchoice in your posts), or by talking with a friend, coworker, or member of your family. "Did you know that this is National School Choice Week?" is a good question to get the discussion going. When more Americans talk about opportunity in education, more parents will discover the options available for their children's education. That means that more children will have the chance of being matched with schools that meet their unique talents, challenges, needs, and interests. This National School Choice Week, all that it takes is one conversation to brighten the future of a family. Will you start one?